A while back I went on a search to find some vegan-proof lunch spots in Antwerp. I totally forgot to tell you about a new-ish little place (opened in 4 months ago) until I came across these pictures in iPhoto (somewhere in between the 20,000 pics - and yes I often make back-ups + delete haha). Located in one of my favourite streets of Antwerp, Sint Jorispoort (coincidentally close to another vegan-proof spot), Carotterie 2000 is a small vegan/vegetarian place which serves up homemade breakfasts, lunches, juices and snacks. I was dying to try it, secretly hoping it would compare to my all-time favourite in Munich. With high expectations, a big appetite and my vegan-partner-in-crime (my sister), I headed to Carotterie for lunch. Let me first get the negative out of the way. I was a little disappointed with the place itself. Firstly, the design is not my taste at all, a bit cold I would say, and not very cosy. Secondly, although it's small, there's room for people to sit but it's on bar chairs facing the wall, which is more of a "fastfood" way of eating. I was hoping for some cosy tables, but the design of the place doesn't really allow it. A missed opportunity because after eating there once I would only really do take-away instead of sitting down! Okay now we got that out of the way, let's talk about the most important thing: the food! 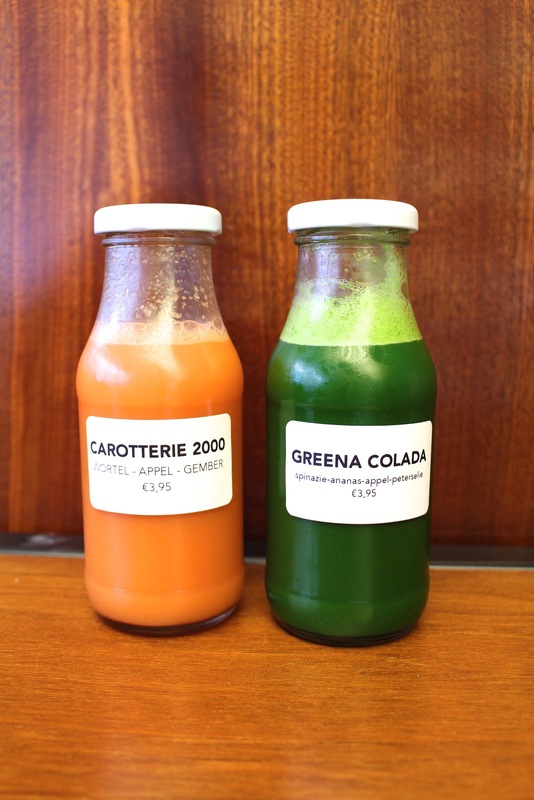 We picked out two fresh juices to start with, which were both delicious! Carotterie 2000 contains carrots, apple and ginger, which is always a winning combination. My sister's Greena Colada was even tastier: spinach, apple, parsley and pineapple. Sweet, fresh and green at the same time! My lunch looked a little less colourful but it was definitely just tasty. Next to the salads, there's a range of sandwiches to choose from. There are 4 vegan sandwiches, one of which is the Vegan Aubergine Star. Of course I had to pick it (I love the names on the menu!) It's a fresh crunchy sourdough baguette (plus points for sourdough!) with grilled aubergine & zucchini, organic homemade vegan cashew ricotta (yum! ), marinated sweet bell pepper and coriander. A perfect combination of different flavours, I loved it. I could easily have this for lunch every day! Although my first impressions of Carotterie weren't great, I was pleasantly surprised by the food. It's fresh, full of flavour, vegan (most of it), colourful and homemade. Everything you could ask for in a lunch basically. Another good thing are the prices, which are very reasonable for the amount of preparation, work and fresh ingredients which are used. You can get breakfast for €4, a sandwich for €5. Prices you wouldn't even dare dream of in London at a vegan place. Although I don't think it's very cosy to sit down for food at Carotterie, I can definitely recommend this place for a good take-away lunch in Antwerp or a breakfast on-the-go.